One must give credit where credit is due. Zombies typically have a blank, hungry look, and rarely do they show other emotions. The Dazed Zombie Mask, though, does indeed have a dazed, albeit it blank, look. What causes a zombie to become dazed and confused like this, one might wonder? Surprisingly, not a heavy blow to the head. Rather, a zombie might look dazed because there is no food around to pursue. Donning this mask will transform anyone into a zombie with almost alien features, including wrinkled skin and sunken, withdraw flesh. The masks wide eyes help give it a dazed look, while also allowing for the wearer to have clear vision. The last touch is the wild and unkempt black hair that sprouts all around the zombies head. This mask is made from latex and is one size fits all. 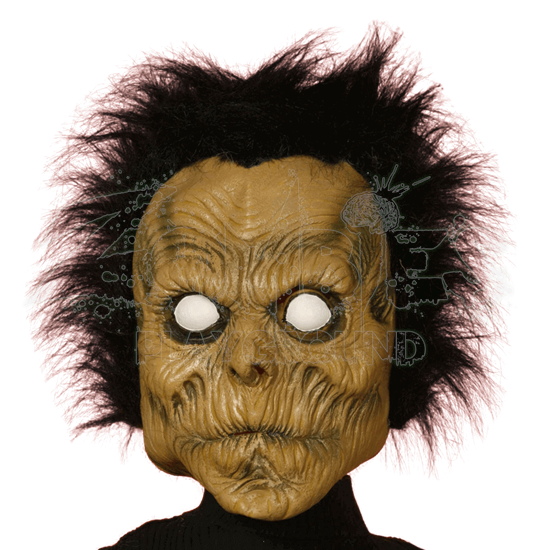 For a distinctive and memorable zombie look, put on your costume, don your Dazed Zombie Mask, and put yourself in a proper undead mindset. Then, shuffle your way down your street and watch as you turn heads with your impressive undead countenance.